Software: NetEnt, Microgaming, NYX, Quickspin, Thunderkick, Leander Games, and Aristocrat. Spinland Casino is an online casino run by Imperium Network Solutions Limited on behalf of Caddell Limited NV. Spinland Casino is one of the newest UK NetEnt online casinos around and was established in 2017. The casino is regulated by the UK Gambling Commission and is fully licensed. There are over 500 games available at the casino from the industry’s best software providers, such as: NetEnt, Microgaming, NYX, Quickspin, Thunderkick, Leander Games, and Aristocrat. Players can choose to play their favorite games for real money or for fun. Some firm NetEnt favourites which are available at the casino include: Gonzo’s Quest, Aloha Cluster Pays, Dead or Alive, Jimi Hendrix, and Divine Fortune. Microgaming slots are also available and include: Thunderstruck II, Bridesmaids, Break da Bank Again, and Tarzan. If you enjoy games with a live dealer, then you will definitely enjoy games from Evolution Gaming, which include: Live Blackjack, Roulette, Baccarat, and Poker games. Try your hand at one of the many jackpot games, such as: Mega Moolah, Mega Moolah Isis, Arabian Nights, Cosmic Fortune, or Hall of Gods. Players can play immediately, and no downloads are required. The casino is fully licensed and regulated by the UK Gambling Commission. It is also audited by eCogra so players can be guaranteed that they have a safe and secure online experience. Live chat is available 24 hours of the day, 7 days a week. The casino is mobile friendly. There is no Telephone support at this casino. All new players residing in the ROW can take advantage of the 200% bonus up to €/$3000 + 50 Starburst Bonus Spins when they make their first deposit at Spinland Casino. The minimum deposit is €/$20 to get your welcome offers. All players get loyalty points when they make a deposit at Spinland Casino. These points can be exchanged for awesome casino bonuses. All new players receive 500 Free loyalty points when they first sign up for a casino account. New players only. Players must be 18 years or older. Click here for full terms and conditions. BeGambleAware. All new players residing in the UK can take advantage of the 100% bonus up to £3000 + 50 Starburst Bonus Spins when they make their first deposit at Spinland Casino. The minimum deposit is £20 to get your welcome offers. 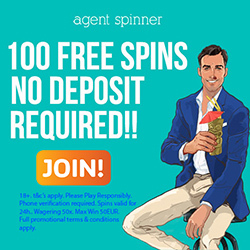 All new players* can sign up to get 20 No Deposit bonus spins on any NetEnt slot that they like. Sign up for a casino account at Spinland, log in and open up the slot to get your 20 bonus spins. *Players from the UK are not eligible for No Deposit offers. The Welcome bonuses carry a wagering requirement of 35 times. The maximum winnings that can be won from the No Deposit bonus spins is capped at £50. The maximum bet allowed when any bonus money is in play is £5. Please note that deposits made via Skrill or Neteller are not eligible for the Welcome bonuses. All winnings will be declared void. Slots count 100%, except for the following slots which count 20%: Blood Suckers, Dead or Alive, Devils Delight, Kings of Chicago, Jackpot 6000, Lucky 8 Line, Mega Joker, Super Nudge 6000, Big Bad Wolf, 300 shields, Secrets of the stones and Victorious. Table games and Video Poker games do NOT contribute towards wagering requirements. EUR, GBP, SEK, NOK, CAD, and NZD. MasterCard, Visa, Paysafecard, Sofort, Skrill, Neteller, Giropay, Trustly, dotpay, and Bank wire transfer. Withdrawals using e-wallets, and credit/debit cards, and bank transfers may take between 3 – 5 banking days. The pending time may take up to 96 hours. Afghanistan, Albania, Algeria, American Samoa, Angola, Australia, Austria, Belgium, Bolivia, Bulgaria, Cuba, Denmark, Ecuador, Estonia, Ethiopia, France, Ghana, Guam, Guyana, Hungary, Indonesia, Iran, Iraq, Israel, Italy, Kenya, Lao Peoples Democratic Republic, Latvia, Lithuania, Malta, Myanmar, Nigeria, North Korea, Northern Mariana Islands, Pakistan, Panama, Papua New Guinea, Poland, Réunion, Romania, Russia, Sao Tome and Principe, Singapore, Slovenia, South Africa, Spain, Sri Lanka, Sudan, Syria, Tanzania, Thailand, Turkey, Uganda, Ukraine, United States, United States Minor Outlying Islands, Vietnam, Virgin Islands (U.S.), Yemen, or Zimbabwe. Customer support is available via Email, and Live Chat.